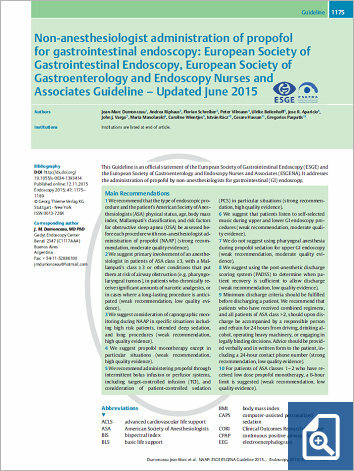 This Guideline is an official statement of the European Society of Gastrointestinal Endoscopy (ESGE) and the European Society of Gastroenterology and Endoscopy Nurses and Associates (ESGENA). It addresses the administration of propofol by non-anesthesiologists for gastrointestinal (GI) endoscopy. 1 We recommend that the type of endoscopic procedure and the patient’s American Society of Anesthesiologists (ASA) physical status, age, body mass index, Mallampati’s classification, and risk factors for obstructive sleep apnea (OSA) be assessed before each procedure with non-anesthesiologist administration of propofol (NAAP) (strong recommendation, moderate quality evidence). 2 We suggest primary involvement of an anesthesiologist in patients of ASA class ≥3, with a Mallampati’s class ≥3 or other conditions that put them at risk of airway obstruction (e.g. pharyngolaryngeal tumors), in patients who chronically receive significant amounts of narcotic analgesics, or in cases where a long-lasting procedure is anticipated (weak recommendation, low quality evidence). 3 We suggest consideration of capnographic monitoring during NAAP in specific situations including high risk patients, intended deep sedation, and long procedures (weak recommendation, high quality evidence). 4 We suggest propofol monotherapy except in particular situations (weak recommendation, high quality evidence). 5 We recommend administering propofol through intermittent bolus infusion or perfusor systems, including target-controlled infusion (TCI), and consideration of patient-controlled sedation (PCS) in particular situations (strong recommendation, high quality evidence). 6 We suggest that patients listen to self-selected music during upper and lower GI endoscopy procedures (weak recommendation, moderate quality evidence). 7 We do not suggest using pharyngeal anesthesia during propofol sedation for upper GI endoscopy (weak recommendation, moderate quality evidence). 8 We suggest using the post-anesthetic discharge scoring system (PADSS) to determine when patient recovery is sufficient to allow discharge (weak recommendation, lowquality evidence). 9 Minimum discharge criteria should be fulfilled before discharging a patient.We recommend that patients who have received combined regimens, and all patients of ASA class >2, should upon discharge be accompanied by a responsible person and refrain for 24 hours from driving, drinking alcohol, operating heavy machinery, or engaging in legally binding decisions. Advice should be provided verbally and in written form to the patient, including a 24-hour contact phone number (strong recommendation, lowquality evidence). 10 For patients of ASA classes 1–2 who have received low dose propofol monotherapy, a 6-hour limit is suggested (weak recommendation, low quality evidence).